In my home, when we are not busy consuming simply vegetables, we are normally eating dishes based off of Americanized Mexican, Italian, or Asian recipes. I want to share with you a recipe that revolutionized our home. Today’s experiment: Homemade Whole Wheat Tortillas. When I was a kid, tortillas were considered a precious commodity. There were six hungry kiddo mouths to feed, so my mom didn’t often purchase tortillas. Sliced bread is cheaper and lasts longer than tortillas. Tacos were reserved for special occasions, like my birthday, where I asked to eat tacos for my birthday every year. That mentality has grown with me. My husband and I weren’t eating tortillas very often. They were even more special when we lived in Europe and had to drive three hours to buy tortillas. Needless to say, I started making my own tortillas. Still, they were a bother. I would triple the batches and freeze the tortillas because they were so hard for me to make and took forever, standing beside the hot oven, flip, flip, flip (maybe because I tripled the batch?). So, I have to tell you that I have been searching for the perfect tortilla recipe for two years. Yes, that is my commitment to good tortillas. I think I’ve tried two white flour recipes and four that use whole wheat. We are trying to move away from refined flour in our home, but whole wheat tortillas are even harder to make because they are less pliable. Here, my Friends, is the fruit of my labor. Enjoy it. 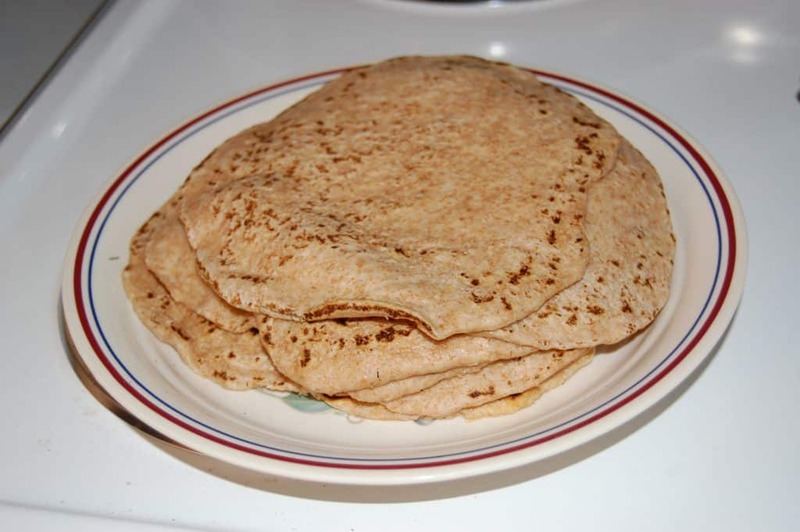 The best, and easiest, whole wheat tortilla recipe. Combine all the dry ingredients. Yes, there is white flour in this recipe because if you used only whole wheat, the tortillas would resemble frisbees more than tortillas. TIP: unless the whole wheat products you are buying in the store say 100% whole wheat, they have white flour in them too. Add the liquid ingredients and mix well. I normally ditch the fork after a couple stirs and dig in with my well-washed hands. Roll the balls into thin rounds and cook over high heat. You’ll know it’s time to flip when you see bubbles forming on top. The second side needs to cook only a couple of seconds. One key to cooking these puppies is that you have to have the griddle or skillet pre-heated. I normally turn it on while I’m mixing all the ingredients. It needs to be hot! And if you already have it going, you’ll know whether you need to turn your heat up or down a notch once you see how the first tortillas is turning out. BONUS! Double the baking powder in this recipe and you’ll get flatbread instead of tortillas! Mmm, what delicious meal are you going to make with these tortillas? Got a better recipe than mine? Share it! My husband loves Subway’s flatbread. Does this turn out like that when you double the baking powder? Do you still heat the flatbread over a pan or do you bake it? I’ve never had Subway’s flatbread… Sorry! You still make the flatbread in the pan like you would the tortillas. All I can say is Thankyou! I too have been on a mission to find a good tortilla. I was fixing tortillas for hours to freeze burritos and before going to bed I came across your recipe and went into the kitchen and gave it a shot.out of desperation . These are wonderful and I indeed am enjoying the fruit of your labor . I thankyou for not giving up.